The MX-C301W is a sophisticated A4 powerhouse of functionality. Encompassing the advanced features usually reserved for larger A3 MFPs, the MX-C301W is built for quality performance and four-in-one efficiency. This state-of-the-art document system is ideal for businesses of any nature and size. Its versatility proves to be an exemplary model for both larger offices, as a part of a network of A3/A4 MFPs, and for smaller offices, as the solo document performer. The MX-C301W offers the practicality of wireless access via two easy modes: infrastructure mode and access point mode. The modes allow for the MFP to accommodate various user-environment factors, including installation location and the type of LAN available. Infrastructure mode wirelessly connects the MFP to notebook PCs and other mobile devices via a commercially available wireless LAN router. This ensures that when wired LAN is unavailable, there is still convenient access to the MFP. The access point mode wirelessly links a LAN-wired MFP to notebook PCs and other mobile devices without going through a wireless LAN router. The MFP is accessible via both wired and wireless connections. 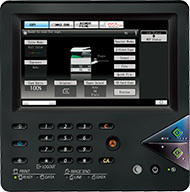 Infrastructure mode wirelessly connects the MFP to notebook PCs and other mobile devices via a commercially available wireless LAN router. This ensures convenient access to the MFP even from places where wired LAN is not available. Access point mode wirelessly connects a LAN-wired MFP to notebook PCs and other mobile devices without going through a wireless LAN router. The MFP can be accessed via both a wired connection and a wireless connection. Note: External networks cannot be accessed via the MFP. Up to five mobile devices can be wirelessly connected to the MFP at the same time. The MX-C301W is equipped with a 7.0-inch WVGA touchscreen colour LCD that provides easy navigation of MFP functions and settings. The LCD also shows thumbnail displays and data file previews, raising the bar on user friendliness. The control panel can be tilted for easy viewing, even from a wheelchair. The tilt angle can be set anywhere from 13.5 degrees to 63.5 degrees. The MX-C301W comes equipped with Auto Colour Mode supplying users with high-quality automated copying. This function allows the MFP to create clear and sharp copies from documents that contain not only text but also photos and maps. Auto Colour Selection automatically determines whether a page is colour or B/W. The contents of each page are then analyzed to distinguish between different components, such as photos and text. Appropriate copy mode for the page is selected allowing background Suppression to automatically remove unnecessary background colour for clearer output.